Golden Raw silk embllished Blouse. 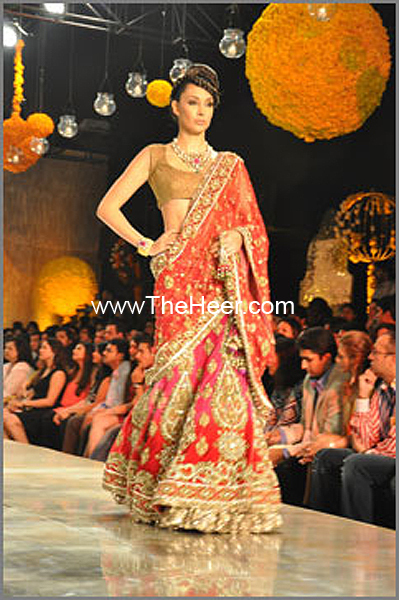 Flame Red heavily embllished Lehenga. Flame Red Crinkle Chiffon emblsihhed Dupatta. Embellishments made with sequins, beads, cut pipes,dabka, pearls, thread and Swarovski crystals. An amazing high fashion trousseau. 100% hand embellished. 100% pure imported fabric. Made in Pakistan. I love my bridal dress so much. My online buying experience is excellent. You are just awesome. The work is too good:) Keep it up!!! Click the button below to add the HDIL03 Flame Red Golden Crinkle Chiffon Banarasi Jamawar Lehenga to your wish list.